What type of clothing does your baby wear during bedtime? Choosing the best baby pajamas will not only ensure that your little one gets the most restful sleep possible but will also result to you having more hours of quality sleep (without being woken up by a fussy child in the middle of the night). Once your baby is asleep in a soft, comfortable pair of pajamas, you can also look forward to snoozing off with no worries through the night. Read our latest guide about the best baby hooded towels. 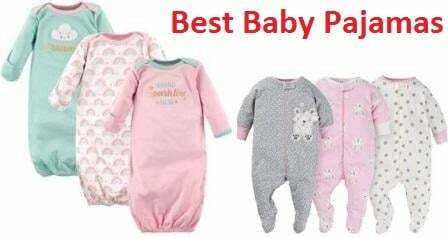 As you choose the best baby pajamas, you should also consider the weather and temperature when they will be worn. During summer, look for pajamas made with lighter materials which will keep your baby feeling cool and away from an overheated sensation. As the months go colder, you can choose pajamas made with materials that can keep your baby warm and toasty without feeling the discomfort of a freezing atmosphere. Read our complete guide about the best diaper backpacks. It is important to look for a pair of baby pajamas that fit snugly on your baby, without a hood or any loose material that can be a safety hazard. As your young child moves around while asleep or dozing off, the extra cloth around can cover his or her face and cause suffocation. Choose a pair of pajamas that will fit your child snugly but without being too constricting that it causes discomfort. If your baby’s pajamas do not have a snug fit, then it should be flame-resistant to ensure your baby’s safety against accidental exposure to flames. The material can be naturally flame-resistant, such as the case with polyester baby pajamas. While polyester is not inherently flame-resistant, the process by which it is developed makes it so; this is the reason why polyester does not need additional chemical treatments to make it flame-resistant. Materials that are not naturally flame-resistant may be treated with chemicals to make them resistant to flames. If you are worried about exposing your little one to the chemicals used to make the clothing flame-resistant, choose snug-fitting, chemically-untreated baby pajamas instead. While pajamas are designed to keep your baby warm, the pair should, on the other hand, not be too warm that it causes discomfort. Stay away from synthetic materials that can keep the heat and sweat close to your baby’s skin. Instead, look for baby pajamas made of breathable materials such as cotton, spandex, or a cotton blend that will keep your young one warm while letting the air through to maintain a cool, comfortable sensation throughout the night. Your baby’s sensitive skin needs to be clothed with only the softest and gentlest of materials. This is even more important during sleep when the slightest irritation can interrupt a deep slumber – not good sleep-wise both for your baby, and you. If your baby has extra-sensitive skin (such as from eczema, allergies, or other skin conditions), avoid synthetic materials such as polyester and choose natural ones such as cotton that let the skin breathe. Natural fabrics are also very soft to the touch, ideal even for extra-sensitive skin conditions. While it can be a challenge to put a squirming, fussy baby into a pair of snug-fitting pajamas, a bigger challenge presents itself when it’s time for a diaper change – and the clothing’s only opening is tricky to manage. Save yourself the extra moments of frustration through every diaper change, by choosing baby pajamas that have buttons, snaps, or a long zipper down the legs. These can be unfastened in a hurry if needed & can also be closed with ease after the diaper change so you can spend more time cuddling with and enjoying your baby – and less time stressing over the diaper change. The best baby pajamas will keep your little one warm and comfortable throughout the night, so he or she can have the deepest of slumbers without being woken up by discomfort. A pair of pajamas with a breathable material will also keep your child away from an overheated sensation by keeping the sweat away from his or her skin and letting cooling air in. Snug-fitting pajamas are designed to follow your baby’s movements; this can prevent sleep interruption caused by the feeling of being trapped in restricting clothing. The best baby pajamas with naturally flame-resistant materials can keep your baby safe from fire hazards – something that you may not be worrying about but can pose a threat especially due to accidents. The snug fit of high-quality baby pajamas will also ensure that there is no excess fabric or material that can cover your baby’s face to cause suffocation, which can lead to SIDS (Sudden Infant Death Syndrome). Baby pajamas that have convenient fastenings make it easier for you to change your baby’s diapers – even numerous times during the night. You can change the diapers as often as needed to ensure that your baby’s skin is protected from the wetness that can cause a diaper rash, with the help of baby pajamas equipped with convenient to open-and-close snaps, zippers, or buttons. Baby pajamas come in a wide variety of designs and colors, which makes it easy for you to dress up your little one according to the season, following a theme or color, or just however your mood strikes on that particular night (or day). Your baby will look even more adorable as he or she falls asleep snuggled in the cutest pajama pairs you can find! The Owlivia Organic Cotton Baby Boy Girl Zip Front Sleep ‘N Play is made with 100% GOTS-certified organic cotton, without the use of pesticides or harsh chemicals. This pair of baby pajamas is equipped with long sleeves that will keep your baby warm throughout the night, without feeling overheated. It has a zip closure from the neck to toes which can easily be opened and closed – ideal for frequent diaper changes – to prevent too much disruption to your baby’s sleep. The organic cotton material keeps the sweat away from your baby’s skin. It also lets the air in, so your baby does not feel too warm especially with no position changes throughout the night. 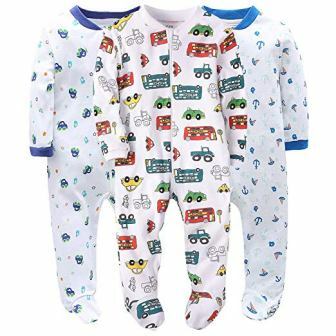 The high-quality cotton ensures that this pair of baby pajamas will retain its shape for a long time – even with frequent use and through repeated washings. The 100% certified organic cotton material is of this pair of baby pajamas has naturally-grown fibers that have not been treated with pesticides or harsh chemicals – making it completely soft and gentle for your baby’s sensitive skin. It comes with extra space for the diaper to prevent a too-tight feeling in that area for your baby. The Owlivia Organic Cotton Baby Boy Girl Zip Front Sleep ‘N Play features a footed design that will keep your baby’s feet warm and toasty through a good night’s sleep. The neck-to-toe zipper closure is covered with a soft material that protects your baby’s skin from the hard material of the zipper. 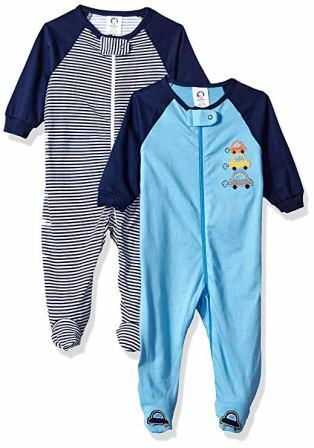 This baby pajama pair is equipped with a zipper closure – with chin and interior cloth guards – that stretches from the neck all the way down to the toes area. This zipper can easily be closed and opened when needed, making it ideal for quick and frequent diaper changes throughout the night (or day). Dordor & Gorgor Organic Zip Front Sleep ‘N Play Unisex Footed Baby Pajamas are made of 100% organic cotton that is GOTS-certified. The cotton material is colored with a natural dye which is obtained from the fruits, flowers, or leaves of plants. This pair of baby pajamas was not colored with chemical dye products. This pair of baby pajamas come with long sleeves that will keep baby’s arms warm through a good night’s sleep. The ribbed cuffs will ensure that the cold will not creep in through the armholes. It comes with a snap button collar that can keep the fabric securely closed without harming baby’s skin. The 100% organic cotton material of this pair of pajamas is hypoallergenic, chemical-free, bleach-free, and pesticide-free. It has no flame retardants, formaldehyde, latex, phthalate, and other harmful components – making this pair of baby pajamas completely safe for your baby. No chemical dyes were used to color these pajamas; plant-based dyes were used to give this product its lively hue. This product is equipped with attached socks that will keep your little one’s feet and toes warm without you worrying about socks that go missing after a few hours of use. Dordor & Gorgor Organic Zip Front Sleep ‘N Play features a breathable cotton material that keeps the sweat away from your baby’s skin. While keeping your baby warm, it also lets the air circulate so your young child stays coolly comfortable. The zipper is covered with a safety tab that will keep your baby’s delicate skin protected from the hard zipper material. 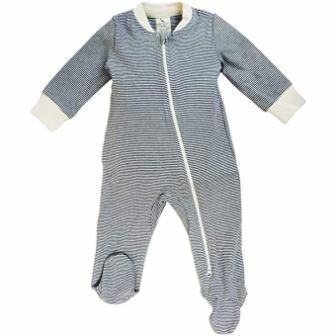 This organic baby footed pajamas comes with a zipper that runs from the neck to the toes for convenient opening and closing especially during diaper changes. The Gerber Baby Girls’ 2-Pack Blanket Sleeper baby pajamas are made of 100% polyester microfleece. The polyester material is flame resistant for enhanced baby safety. The polyester material of this pair of baby pajamas will feel ultra-soft on your baby’s skin and will contribute to a restful slumber at night. The long-sleeved design keeps little arms protected and warm for several hours of sleep, while the ribbed cuffs ensure that the sleeves stay in place and keep the cold from coming inside the garment. These pajamas come in adorable colors and prints that can brighten the mood of your little one (and yours as well). It comes with a long zipper that runs from the neck to the toes area for easy access. The polyester material is flame-resistant, adding another level of safety for your child if there is accidental exposure to a flammable substance. The 100% polyester microfleece material – which feels just like a soft fleece blanket – is guaranteed to bring gentle softness & comfort to delicate baby skin, promoting a good night’s sleep. The zipper is equipped with a soft cloth tab that protects your baby’s chin from the hard zipper material. 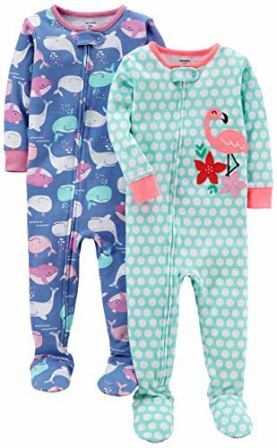 The Gerber Baby Girls’ 2-Pack Blanket Sleeper baby pajamas come with a long zipper that runs from the neck to the leg, which can easily be closed and opened for easy access – especially helpful for frequent diaper changes. The Gerber Onesies Baby Girl Sleep N’ Play Sleepers 3 Pack pajamas are made from 100% cotton jersey. This pair of baby pajamas come in cute colors, with appliques and embroidery that makes the garments even more adorable to look at. The cotton jersey material of these baby pajamas offers superior breathability that keeps your baby warm during the night while maintaining a cool sensation. The cotton also helps keep sweat away from your child’s skin. It comes with a front zipper opening that runs from the neckline down to the ankle. This is very convenient for quick diaper changes that can be done without completely disturbing your baby’s sleep. The breathable cotton jersey material feels soft against your baby’s delicate skin. This material will also keep your little one cool and comfortable as it keeps sweat away from the skin, maintaining a cozy warmth through several hours of sleep. The zipper is covered with a cloth tab on the neck area to keep the delicate skin protected from scratches which may come from the zipper. The Gerber Onesies Baby Girl Sleep N’ Play Sleepers 3 Pack baby pajamas come with a zipper closure that can be opened from the neck to the ankle. The Marque Baby Boys Footed Pajama is made with 100% breathable cotton that keeps the sweat away from your baby’s skin. The cotton material is expected to undergo a slight shrinkage after the first wash. It is important NOT to use hot water to wash the garment, or a dryer, as these can both damage the pair of baby pajamas. The Marque Baby Boys Footed Pajamas come in adorable prints and colors that will be a delight to look at – for both babies and adults. The 100% cotton material will keep your baby warm through several hours of sleep at night. The garment is also ideal for use during the day, for baby’s play or leisure time. The long-sleeved design will keep your baby’s arms protected from the cold, with ribbed cuffs that will not let the cold air in. This baby pajama pair is equipped with attached booties/socks that will firmly stay in place to keep little feet & toes warm– you will not have to worry about missing socks anymore! 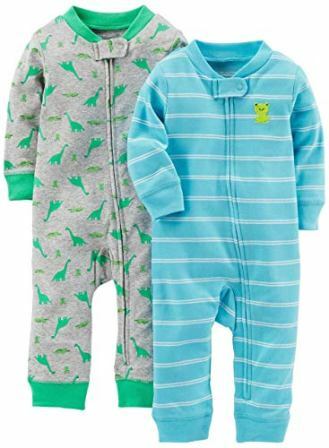 This pair of baby pajamas come in a soft cotton material that is highly-breathable and will keep your baby comfortably warm through the night. It is also ideal for use during the daytime as the cotton will help maintain a coolly comfortable sensation. The Marque Baby Boys Footed Pajama features a front zipper closure that extends from the neck to the knee area. It can be opened and closed conveniently, making it easier for you to deal with several diaper changes throughout the night or day (without having to remove the entire garment). The Simple Joys by Carter’s Baby Boys’ 2-Pack Cotton Footless Sleep and Play pajama pair is made of 100% cotton rib. For newborn and preemie sizes only, this pair of baby pajamas come with fold-over cuffs. The garment is machine washable, making it easier to maintain and clean. The cotton rib material of the Simple Joys by Carter’s Baby Boys’ 2-Pack Cotton Footless Sleep and Play is superbly soft. The cotton material is breathable and keeps sweat away from your baby’s skin. It comes with a footless design that lets your young one’s feet and toes move freely without any hindrance. This baby pajamas pair is ideal for use during baby’s sleep time, or for his or her leisure and play time. The soft cotton rib material of this pajama pair will feel comfortable on your baby’s skin, making this garment ideal both for sleep time at night and for leisure/play time during the daytime. The footless design is great at keeping little feet cool and sweat-free, with no fabric to cover your baby’s feet. You can easily use extra socks or booties if needed. A safety tab on the on the chin area protects your baby’s delicate skin from scratches that can come from coming into frequent contact with the zipper. This pair of baby pajamas come with a zipper that runs from the chin to the ankle. It can easily be opened or closed whenever needed, such as for numerous diaper changes throughout the day or night. The Vaenait baby Infant Toddler 100% Cotton Kids Girls Easter Rabbit Sleepwear Pajama 2pc Set is made with high- quality 100% cotton. This baby pajama pair features a printed label on the back that does not use a tag, eliminating the friction that can lead to skin irritations as the tag rubs against your baby’s delicate skin. It features banded cuffs, legs, and crewneck that keeps the garment in place, and makes sure that your baby stays warm & comfortable for a restful night of sleep. The extra-wide waistband provides a more comfortable experience. The footless design leaves small feet and toes free to move, without feeling constricted or overheated as they tend to do when covered with extra fabric. This pair of pajamas is designed to have a snug fit, to greatly decrease or eliminate the risk of catching fire. It is made with a 100% cotton material that wicks moisture away from your baby’s skin and promotes air circulation for a comfortably cool sensation. Your baby’s skin is protected from unnecessary friction with the tag-less label printed on the pajamas’ back. Your young one can now move without the irritation and pain of a tag repeatedly rubbing on his or her delicate skin. An extra-wide waistband makes sure that your little one’s tummy area is not painfully pinched by a thin, too-tight material. This 2-piece pajama set can easily be worn and removed. The cuffs, legs, and crewneck are banded to keep the cold temperature away from your baby’s body. The Gerber Baby Boys’ 2-Pack Sleep ‘N Play baby pajamas are made of 100% cotton. These pajamas come with interesting embroidered details that make the garment more attractive, for babies and adults alike. These baby pajama pairs are styled with fitted sleeves that are designed to stay firmly in place, protecting your young one’s arms from the cold and from external harm. It is equipped with a long zipper on the front that extends from the neck down to the ankle area. This makes it easier for the garment to be removed and put on quickly during frequent diaper changes. The built-in booties will keep your little one’s feet and toes warm during cold nights and keep them protected from harm as well. The Gerber Baby Boys’ 2-Pack Sleep ‘N Play, Little Cars baby pajamas for 6-9 months are designed with a snug fit. The 100% cotton material lets the air circulate between the garment and your baby’s skin to promote a coolly comfortable sensation. The cotton baby pajamas keep the sweat away from your baby’s skin. The zipper pull is covered with a safety neck tab that protects your baby’s chin area from being accidentally scratched by the zipper. This pair of baby pajamas is equipped with a front zipper that runs from the neck to the lower leg area, making it easier to remove and put on during diaper changes. The Luvable Friends Cotton Gowns are made with 100% cotton that feels soft and gentle on baby’s delicate skin. These sleeping gowns are made from a breathable, 100% cotton material that will keep your baby feeling cool & comfortable as they sleep through the night. The neck opening can easily be stretched and adjusted accordingly so you can easily put on or remove the garment without exposing your child to awkwardness or discomfort. These baby pajamas have a long-sleeved design that keeps your baby’s arms warm through several hours of sleeping and works to provide additional protection. The sleeves are equipped with fold-over mitten cuffs that help to protect your baby from harm due to accidental/unconscious scratching. The Luvable Friends Cotton Gowns are made from soft cotton and are designed like a dress to provide a coolly comfortable fit for your little one, so she does not feel overheated as she sleeps. The cotton promotes air circulation and prevents moisture from sticking to your baby’s skin. The elastic hem helps to keep the garment securely in place as your baby sleeps and keeps her warm throughout the night. These baby pajamas are designed like gowns, which can be put on and removed as one piece. The hem is elasticized to keep the garment in place; this hem can be lifted with ease for diaper changes. 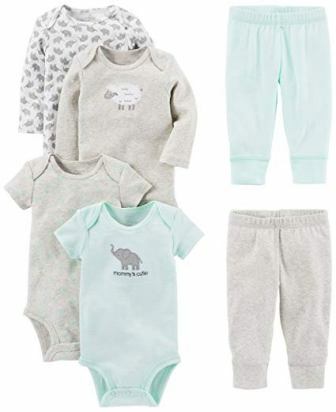 The Simple Joys by Carter’s Baby Girls’ 6-Piece Bodysuits (Short and Long Sleeve) and Pants Set is made from 100% cotton. This set includes two short-sleeved bodysuits, two long-sleeved bodysuits, and two pants. These items can be mixed and matched to achieve the cutest & most comfortable ensemble for your baby. All the clothes in this set are made of 100% cotton, making it soft and gentle enough to be used for delicate baby skin. The bodysuits are equipped with expandable shoulders that make them easier to be placed on and removed. The bodysuits come with nickel-free snaps for easy access during diaper changes. The long-sleeved bodysuits are designed to keep your baby warm and protected when it gets cold. The short-sleeved bodysuits will keep your little one comfortably cool – ideal for sleeping on warmer nights or for use during play/leisure time. The first pair of pants is designed with a back applique, while the second one has ribbed cuffs. Both pants come with covered elastic waistbands. The pants feature covered elastic waistbands that will lie comfortably on your baby’s skin, without painful pinching involved. The bodysuits’ necklines can be stretched easily to accommodate your child’s head without subjecting her to discomfort. The bodysuits are equipped with nickel-free snaps on the crotch area. These snaps can easily be opened during diaper changes and can just as conveniently be closed without having to totally disturb a sleeping baby. This pajama set includes 2 pajama bottoms/pants, 1 short-sleeved pajama top, and 1 long-sleeved pajama top. All the items in this set are made of 100% cotton that gives your little angel a soft, comfortable feeling as she sleeps. The two shirts feature a pull-on neckline that can easily be placed and removed without subjecting your little girl to discomfort. The long-sleeved shirt provides superior comfort and protection from the cold, while the short-sleeved pajama top can be worn during warmer nights or during playtime. The long-sleeved top features a ribbed cuff that keeps the sleeve securely in place and helps protect your baby’s arm from accidental or unconscious scratching during the night. Covered elastic waistbands on the pants enhance comfort for your baby as she wears the garments for several hours at a time. The lightweight cotton material promotes air circulation between the garment and your baby’s skin, preventing an overheated sensation. 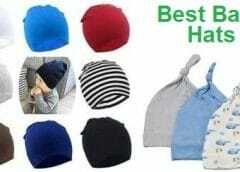 It also helps keep sweat away from the skin to prevent rashes from developing. The pants both have covered elastic waistbands that lie comfortably on your baby’s body without unnecessary pinching. Both pants have banded ankles that keep the garment from riding up the leg. The shirts both have pull-on necklines that makes them easy to put on and remove without any discomfort involved. The pants are equipped with elasticized waistbands that can easily be removed during diaper changes. The Carter’s Baby Girls’ 2-Pack Cotton Footed Pajamas set is made with 100% cotton. This set consists of 2 pieces of footed cotton pajamas with adorable colors and prints. The long-sleeved pajamas are designed to keep your baby protected from the cold especially when the temperature drops during the night. The front zipper can easily open and close these pajamas from the neck down to the ankle for easy access. These pajamas have ribbed cuffs and necklines, which keep the fabric securely in place even when your baby moves frequently during the night. The pajamas in this set both have attached booties or socks. This eliminates the need for you to look for socks that go missing and keeps your little one’s feet warm to promote a good night’s sleep. While keeping your little angel warm, the cotton material of these pajamas will ensure that she will stay comfortably cool. The breathable material keeps the sweat and moisture away from your baby’s skin. A safety cloth tab protects your baby’s chin and neck areas from scratches that can come from repeated rubbing against the zipper and zipper pull. The front zipper can easily be closed and opened as it runs from the neck to the ankle. This helps you manage frequent diaper changes without disturbing your little one too much from her sleep. The pajamas in the Simple Joys by Carter’s Baby Girls’ 2-Pack Cotton Footed Sleep and Play set are made of 100% cotton. The 2 pajamas in this set are both long-sleeved. Your baby will have a restful sleep as she is protected from the cold temperature by these long-sleeved, sleep and play sets. The pajamas come in cute prints and colors that can lift you and your baby’s mood instantly. Both pajamas are equipped with front zippers that can easily be opened from the neck down to the ankles area – giving you the easy access you need when it is time to change your baby’s diaper. The design comes with attached booties that keep your young one’s little feet warm and protected from the cold during the night. 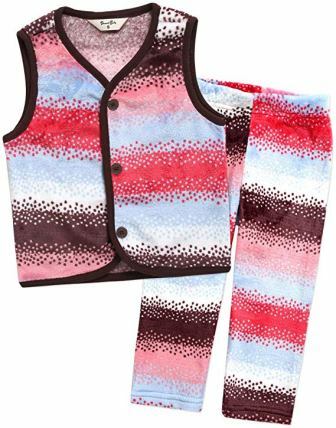 These footed pajamas are also ideal for use during playtime and other leisure activities. The 100% cotton material ensures that your baby is kept warm without sacrificing her comfort as she sleeps. The breathable fabric wicks moisture away from her skin (preventing skin irritations such as a diaper rash from developing), and lets air circulate to keep her coolly comfortable. A safety tab covered with a soft cloth protects your baby’s delicate skin on the chin/neck area from being scratched accidentally by the zipper pull. These pajamas have front zipper closures that give you easy access to the diaper when it is time to change them. The zip closure can be opened from the neck area all the way down to the ankle, enabling you to change the diaper without too much disruption on your child’s restful sleep. The Mac & Moon Baby Girl Sleeper Set, 2-Pack Long Sleeve Footed Sleep & Play Pajamas are made with 100% cotton. These garments are machine-washable, making them more convenient to clean and maintain. These footed pajamas come in 2 different adorable prints and designs that can complete your baby’s ensemble, whether she’s still up and playing or finally going to sleep at night. The long-sleeved design of these pajamas will keep your young angel’s arms warm and protected from unconscious scratching as she sleeps. Their necklines can be adjusted with the help of two snaps (on one shoulder) that can be opened to accommodate more space. These snaps are inconspicuous as they blend in perfectly with the rest of the pajamas’ designs. These pajamas’ footed style keeps your baby’s tiny feet protected against the cold and from harm as she sleeps, or during play time. The soft 100% cotton material keeps your child feeling comfortably cool as she sleeps, while also keeping a lovely warmth inside. The breathable material lets air circulate inside the garment to avoid giving your baby an overheated sensation. Mac & Moon Baby Girl Sleeper Set, 2-Pack Long Sleeve Footed Sleep & Play Pajamas come with a full zipper front, as well as snaps that open the bottom part all the way. These closures provide you with easy access and the ultimate convenience for diaper changes. The Amazon Essentials Toddler and Baby 2-Piece Pajama Set is made of 10% cotton. These pajamas are machine-washable, so you can easily clean and maintain them without having to resort to handwashing. 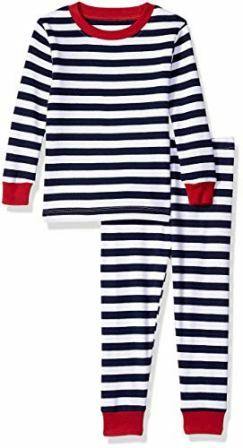 This Amazon Essentials Toddler and Baby 2-Piece Pajama Set includes a pajama top and bottom that has a matched print/design. Bands on the neckline, ankles, and cuffs feature contrasting colors for an interesting style profile. The pants have an elastic waistband that does not pinch delicate baby skin, enhancing your little one’s comfort level while asleep. A pull-on neckline makes this pair easy to put on and remove without causing discomfort for your little one. The long-sleeved design will keep your child cozily warm in cold temperature. This pair of pajamas has a snug fit that increases the level of safety for your child. The 100% cotton material feels soft and gentle to your baby’s skin; it also keeps sweat away so your child does not feel overheated even with sudden temperature changes. The breathable fabric allows air to circulate to keep that cool, comfortable sensation while keeping the warmth intact. The pajama top features a pull-on neckline that makes this garment easy to wear and remove. The pajama bottom has an elastic waistband that works in holding the pants securely in place, without painful pinching of the skin or flesh.